What would happen if your company is left without telephone communication for days? What is the financial loss to your company if your personnel cannot communicate? What is your legal / moral obligation to your customers or other partners? Would people be able to get ahold of you – especially the ones who do not have your personal cell phone numbers? Are your alternative numbers advertised – for example, in the Yellow Pages? Maintenance services generally come in two main flavours, and then also in a variety of shades between these two – it’s up to you to select the best one for your circumstances. There is no right or wrong selection. System failure / power failure, Uninterruptible Power Supply (UPS) failure. Loss of configuration, internal database corruption, Operating System failure. Connectivity failure – ie external such as SIP or PRI Connectivity. External influences such as lightning, power surge, floods, etc. Internal connectivity such as LAN IP routing or switching failure or overload. Isolated cable or LAN switch failure. Operator services failure – such as the inability to transfer, etc. Directory services failure – partial database corruption. Individual voice quality impairment, LAN sections or divisional overload or influences. Now that you understand the different types of failures that can occur, here’s a breakdown of the key elements you need to maintain in order to keep your telephone system pumping. “Uptime” – what is it? Uptime or “availability” refers to the percentage of available working time in a certain company that the electronic communication system is functional. Target percentages range from 99.9% which normally applies to individual small company PBX systems , to 99.9995% (called five-nines) for large telecommunication service provider’s systems. The higher the percentage is, the higher would be the cost to maintain. At 99.99% uptime level, a fully redundant system will probably be deployed on site to ensure this service level can be attained. How reliable is the communication system? Reliability of electronic equipment is specified as “Mean Time Between Failures” (MTBF). It is both empirically determined through experience of the specific system in the field, or it is calculated in a highly scientific way from every component in the system. In most cases, the MTBF is given in years or hours. This value is used in calculating the risk of the specific installation and also therefore the cost to offset or accept that risk – which is normally a factor in the price of a Maintenance Agreement or “Service Level Agreement”. It is fact that electronic equipment does not last forever. Not only are open connections corroded or vibrated loose, but electronic components also have a finite life expectancy. They do not last forever and nobody can really determine why they give in. There is another huge factor and that is environmental influences, which obviously includes higher usage than what is expected, use under adverse conditions and sometimes even abuse which is difficult to prove in most circumstances. What is the bathtub curve and how does it apply to a new voice communication installation? It has been proven that electronic installations / systems exhibit a failure rate incidence which could be depicted as a cut-through bathtub. In the beginning, just after implementation, the failure rate is high in comparison to the rest of the life of the equipment – and at the end of the life expectancy period (probably around 10 years), the failure rate again increases dramatically until the system is not useable any more. It is during the initial time of high failure rates that the equipment is covered by a “guarantee” – i.e. guaranteed against bad workmanship or initially flawed components. The customer nevertheless has to still ensure that the downtime experienced during repair time is as short as possible as that is not covered by any guarantee. The guarantee can be “upgraded” to also include the guaranteed on-site restoration of service time. Our view is that you are the best entity to make a decision about the risk a communication system failure would pose to your company’s profitability and other soft issues, such as loss of opportunity, etc. But we understand that you can’t make these decision without being presented with the choices you have up front, because sometimes it only dawns on you when the crisis has already happened that the preparation should have been different. The risk mitigation or division of risk between different role players should be tabled up front and not after you have lost large sums because of ill communications. Your communications solutions provider should always give you the information you need up front to make this decision and then give you a choice between a contractual and non-contractual service so you can decide how you want to manage your risk. However we do believe that a contractual service will give you the best results and save you money in the long run. 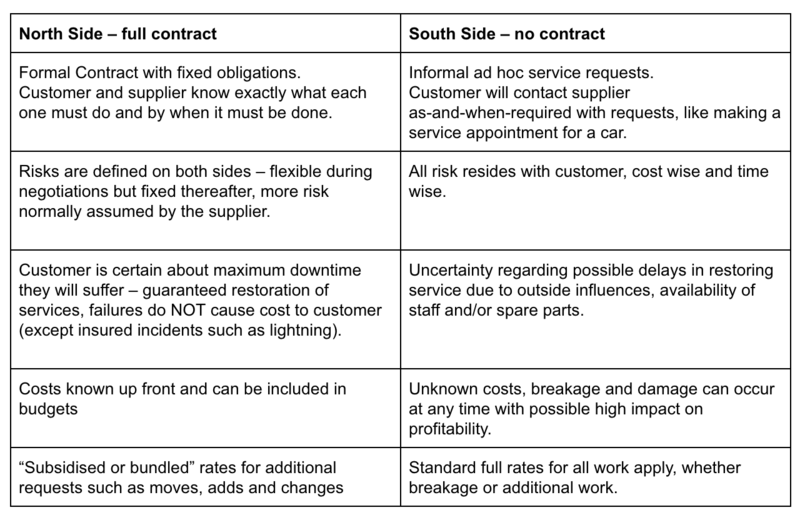 With a bespoke service contract, risk aversion is satisfied a lot better than with insurance – because actual deliverables which can “prevent” failure as far as possible can be built into the service contract, thereby playing a much bigger role than just paying for the actual damage which must be repaired. Preventing failure also saliently prevents the consequential loss as far as possible (However insurance might still be required which is normally excluded as it cannot be foreseen or prevented). If you want to include the risk determination into a “Total Cost of Ownership” study or calculation, it would be prudent to include some failures into the calculation, based on the MTBF figures on this type of implementation – we can provide some basic statistics to determine where the risk values lie. It is impossible to see into the future but we can learn from the past experience and share that with the customer to determine the best value for their service expenditure over the long term. Restore Time refers to the time it would take after a call is logged, to restore the operational service to the customer, in such a way that the customer can carry on normal business. This does not mean that the original system will be made to work and slight operational differences may be implemented to restore the service. It however mitigates the risk of a delay for the service to be restored to the absolute original specification. When a work-around method was implemented to restore functionality, the task will be finalised within the “Resolve Time” – therefore the final corrective action will probably take place after hours in a properly planned and managed way, so that the customer will not be inconvenienced again. It is obviously the intention to attain the above mentioned Restore time in every case – though it could sometimes mean that we would be quicker in some cases, but in exceptional circumstances slight delays may occur. In these isolated cases, the escalation procedures within our service organisation will come into effect and whether day or night, the failure will be automatically escalated on a severity scale to the highest level in our organisation and communication will also be established with the customer’s representative to inform them of actions taken to restore their service. In an effort to continually improve customer experience, we’re always looking for ways to improve operational efficiency and lower costs, field services is poised to dramatically reinvent itself, leveraging innovative technology and approaches to change the way we interact with customers in the field. Because we have a decentralised business model and we continue to support more clients in more locations, especially in the case of Managed Services contracts where onerous SLAs and penalties exist, the administration of our workforce has become more difficult. 1. What did the implementation of the solution entail (what was the process)? In order to effectively migrate existing processes to the new mobility platform, a phased approach was adopted, resulting in minimal disruption to day to day operations. Phase I: Hardware/software developed and integrated into SAP-B1 by the development engineers in consultation with the Nashua IT group, and selected business managers/stakeholders. Phase II: Hardware/software deployed to a few selected employees and the system created and tested by the IT development group. Phase III: Once utilised in a live environment, IT in consultation with the test technicians and product developers, made improvements and corrections. Phase IV: All employees received training on the Mobile1 Solution. Phase V: Our selected Mobile Solution was fully integrated into Nashua Communications business processes (Go Live). Phase V: Continuous measurement and improvement. 2. How long did the implementation take? We tested the first Proof of Concept (POC) within a month, this was a success and the next step was training which took less than a month and from there we were up and running and then just did continuous modifications and upgrades. 3. Was it the right fit to solve the problem (was it successful)? Not only did we optimise field service via the MSX initiative reduce costs, we also enabled us to generate revenue. “Soft” benefits, such as customer perception of the field engineer’s professionalism, also assist in creating increased customer satisfaction. We also benefited from more timely and accurate time capturing and customer billing, due to digitally collecting customer signatures. The Mobility Project directly supports several of the corporate goals and objectives established by us. Ready to get your make sure your company telephony system is update to date and properly maintained? Contact us today and we’ll help you find the right solutions for you.